My husband's 30th birthday is coming up very soon, and to celebrate we're throwing a costume party in movie, tv and cartoon character theme. He's Batman! I'm going as Sailor Moon. I had my costume custom made to my measurements. However, I had some issue getting the accessories. I managed to order the earrings, odango and brooch easily enough, but due to certain complications, I was unable to get a wand or tiara. 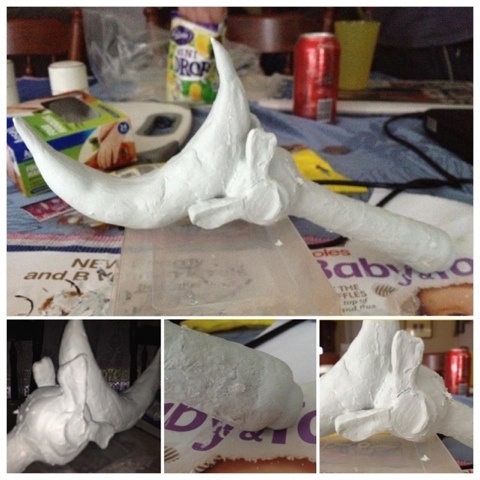 Two weeks out from the party I have decided to make the wand myself and a jeweller friend is making the tiara for me. 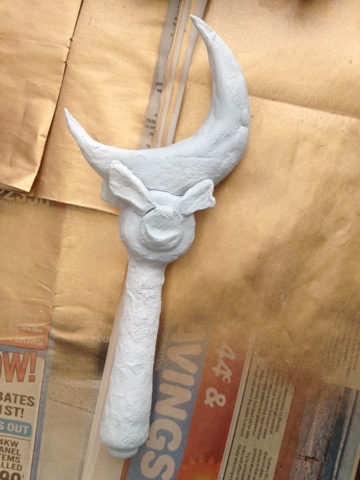 Here's what I have so far for the wand. Once I fill in a few cracks, I'll be painting it with gold (for the moon and details) and baby pink (for the wand) paint. I'll also apply a couple red gems, one either side above the mini crescent moon. Hand modeling this was very tricky and I can only hope once it's done it will be worth all the time and frustration!